It’s finally arrived! BC Vancouver’s first Cora restaurant is here! 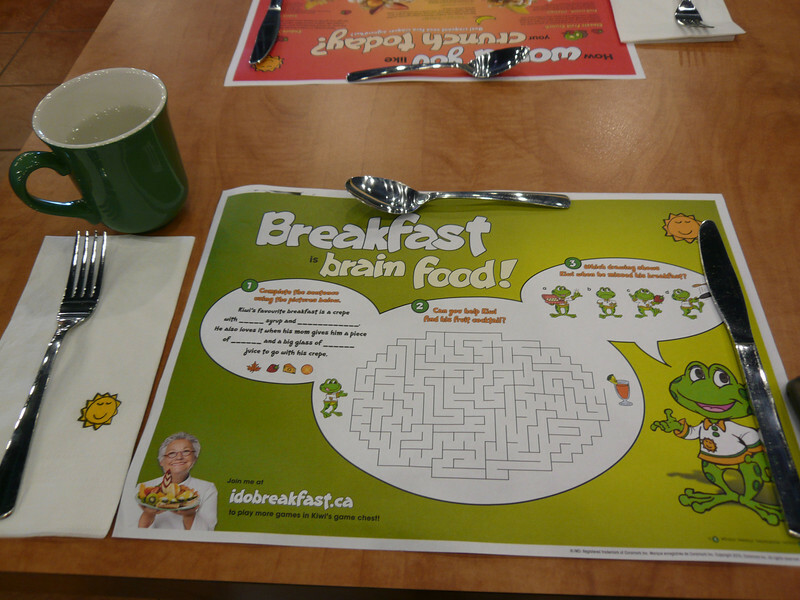 This Canadian breakfast chain was first introduced to me back East when I was in Ottawa. From the time you walk in, you feel like you’re in happy happy land! They really want you to enjoy the beauty of breakfast. If you aren’t a breakfast person (I’m not), you have got to try this place out. You’ll have another perspective when you finish your meal here. Not convinced? Look at how many chefs are in the kitchen serving you! And without any words, I’m sure you can tell by now that this place is all about healthy fruits and veges, not the oily sausages and bacon. And definitely not the pancakes. My girlfriend and I visited this place on a Saturday afternoon. It was their opening weekend, and we were surprised it wasn’t very busy. (Well, maybe because it was in the afternoon.) But, I was expecting the place to be packed! I guess not a lot of people knew of its existence yet. We were seated right when we walked in. I wasn’t feeling all that well that day, so I decided on something light. 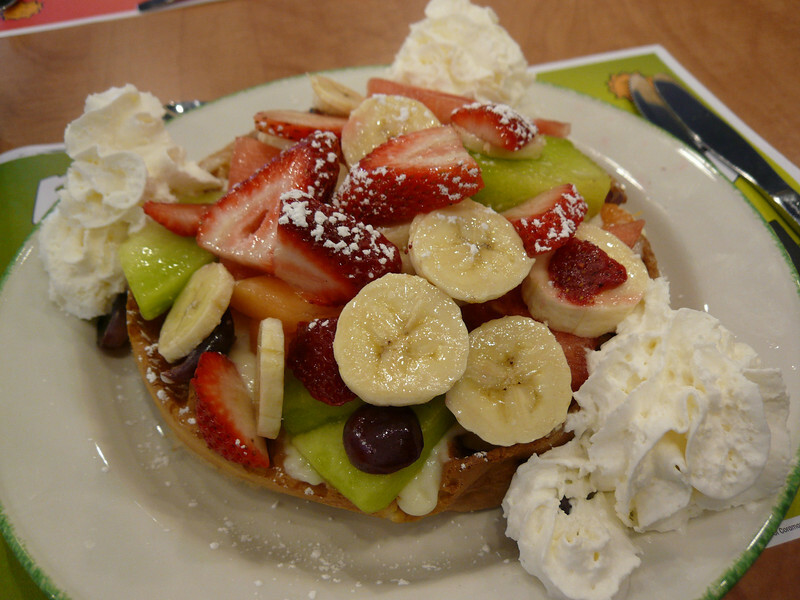 I ordered a waffle served with a mountain of fresh fruit and custard. The fruits were freshly cut and nothing was from the can. 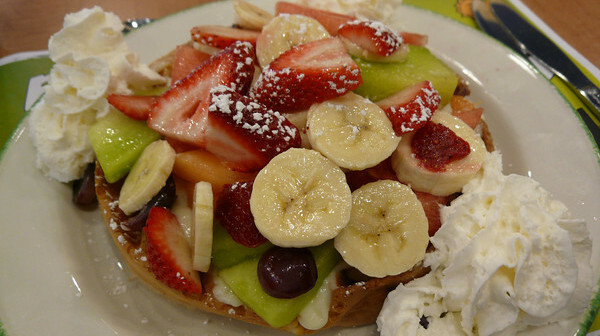 The waffle was tender and fluffy, it wasn’t at all soggy. Probably one of the best waffles I’ve had. I only finished half of the serving, as I really wasn’t feeling all that well. My girlfriend got a crepe filled with ham, cheese, and egg. 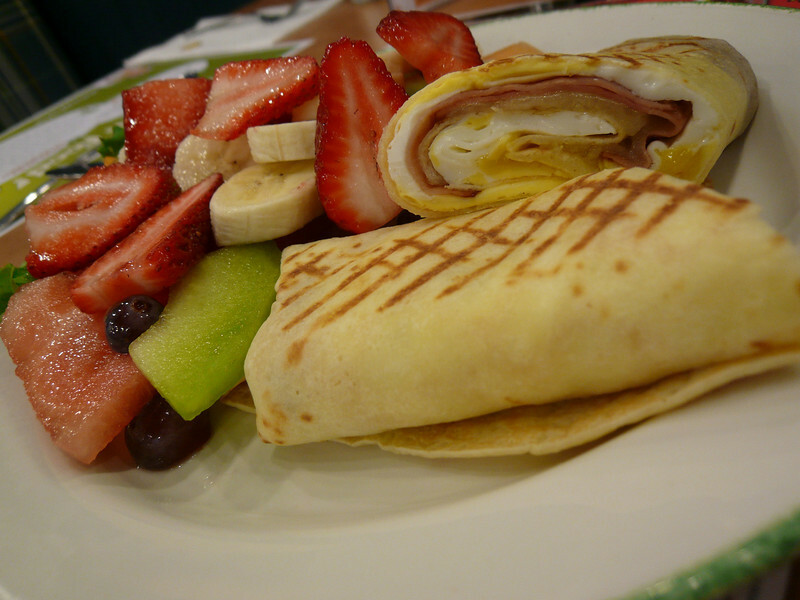 It was served with fresh fruit. She commented on the crepe not being very hot (or rather coldish). This probably due to the uncooked ham? I’m not sure because I didn’t have any of hers. 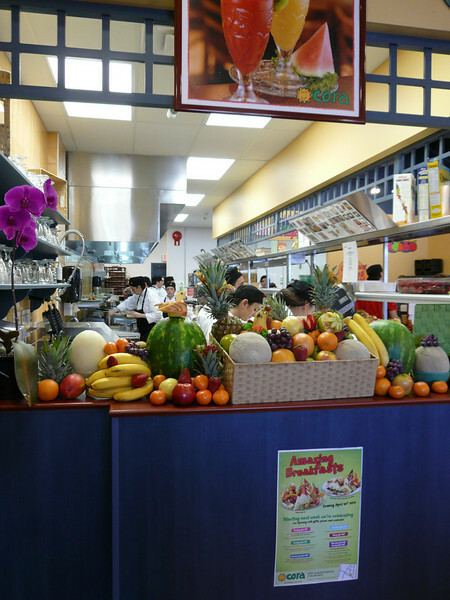 Overall, this place is about freshness and quality! The portions of fruit you get is huge! Probably enough to fill the entire day. They really try to emphasize that breakfast is not just about the coffee and donut. However, all things come with a price. Our meal together came close to $30 with tips. If you can afford Ricky’s, you can afford this place. But, if you’re one of those McDonalds breakfast people, you’re not going to think this is a complete rip off. How much is McDonald’s breakfast anyway? 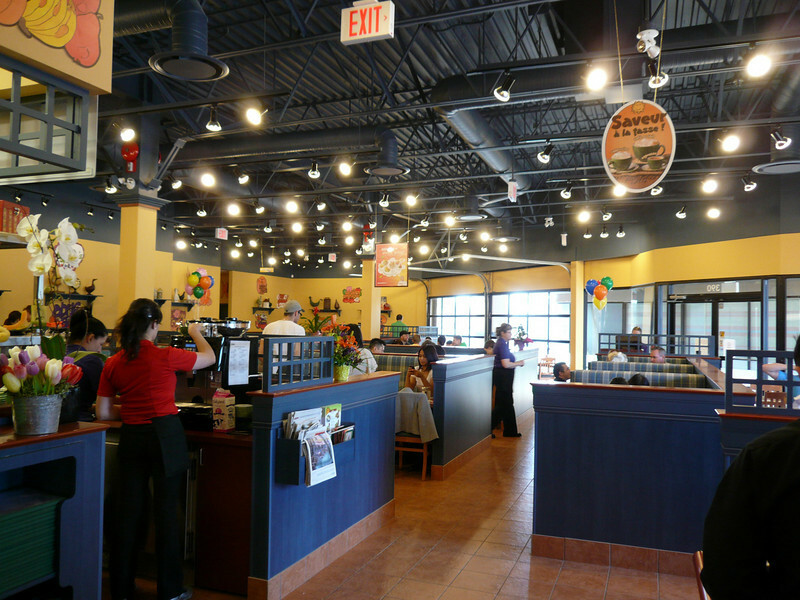 The ambiance in here is very friendly, gives you a feeling that you are in McDonald’s or even happier than McDonald’s. Lastly, just a bit of a history lesson! 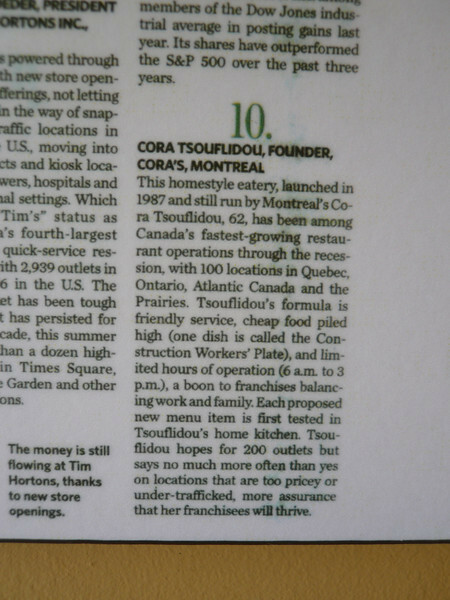 Cora’s one of ten most successful business individuals in Canada! Like always, a question for you! Where is your favourite place for breakfast? Leave me a comment down below! @Buddha Girl: lol actually, Ben pointed it out and I tried fixing my feedburner all night but it didn't work... and then the next morning I did the same thing again and it worked. feedburner was just being ridiculous I guess. Oh! I know that mall! Hehehe! I grew up in that area! My dad still leaves by Coquitlam Centre. Just checked out the link to their site...did they took over the corner where the medical labs used to be??? WOW! That area sure changed A LOT...hahahahahaha! This is weird...I deleted off the old link and added the new link (eatwith.ROBINLEUNG.com) in my google reader but it still re-directs to robinleung.com/eatwith...and the last post it showed is the "Skewers Mediterranean Grill"... Sorry, I am not very savvy with computers...I think the best person to ask would be Ben from Chowtimes since he recently just assisted Janice from www.goodeat.ca with a similar problem. I think the Medical labs is still there, but they took over the supermarket right next to it. Hmm...that's weird. Thanks for pointing out the problem. I will look further into it. Thanks. They were pretty good, despite my upset stomach that day. It's in the same mall as Hon's, Pearl Fever, White Spot, and Matoi Sushi. You should also see a big Safeway on Lougheed Hwy. I've changed my URL a few weeks ago, if you had http://robinleung.com/eatwith (it will not work anymore). The new URL is http://eatwith.robinleung.com. Hence, all my old URL link that comes up in Google Searches are all re-directed to my main domain "robinleung.com". You can update your Google Reader to "http://eatwith.ROBINLEUNG.com" and it should work perfectly. So, if you wanted to go to the Mediterranean Grill post, it's now: "http://eatwith.robinleung.com/2011/03/26/skewers-mediterranean-grill/" I'm not sure how I can update Google searches so that it shows my new URL instead of my old. Any ideas? Thanks.